The management of the University of Lagos (UNILAG) has debunked report that a student of the school was rusticated for dancing with the statue of a late Vice Chancellor of the institution, Professor Babatunde Sofoluwe. In a information shared by the institution’s spokesman, Toyin Adebule, the management called on the students and general public to disregard such report. 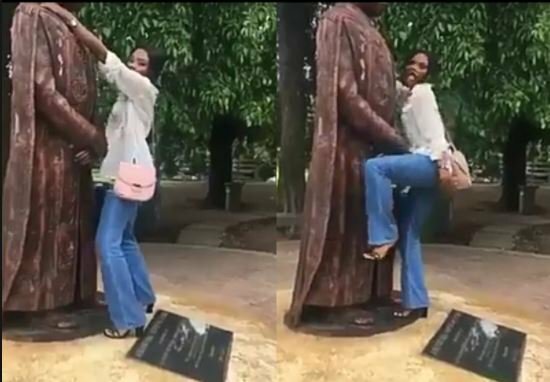 After a video of a female student dancing with the statue of the Professor Sofoluwe hit the social media, there were reports that she had been rusticated for 4 semesters. But Adebule said, “The management of the University of Lagos wishes to inform all students and the general public, that the current information making waves in the social media concerning a student who was allegedly rusticated for four semesters for dancing with the statue of the late Vice Chancellor, Professor A.B Sofoluwe is false and should be disregarded.